Everybody remember the movie Smokey and the Bandit? Burt Reynolds’ tour de force featuring Sally Field, Jerry Reed, and of course The Great One Himself…Mr Jackie Gleason. Well, the main star of that movie was the black and gold 1977 Pontiac Trans Am that Burt Reynolds used to terrorize a host of Mid-South law enforcement allegedly from Texarkana all the way to the Southern Classic in Georgia. Believe it or not, the film was so successful it actually caused Trans Am sales to double in the two years after the movie was released! Well, the 1977 Trans Am is still one of the most famous movie cars of all time, right up there with James Bond’s Aston Martin, Marty McFly’s DeLorean, and Mad Max’s V8 Interceptor. All you need is one glance at a black and gold Trans Am and you’re automatically looking around for an oversized ego in tight pants sporting a thick black mustache and an obnoxiously large cowboy hat. According to some sources, the cars used in the original Smokey and the Bandit were actually 1976 models sporting 1977 front ends and decals. Four cars were used during filming and all four cars were damaged fairly severely as you could imagine. As a matter of fact, the car used in the jump over the bridge was absolutely totaled. It was even equipped with a boost rocket similar to the one Evel Knievel strapped on in his failed attempt to jump Snake River Canyon. The odd thing about that stunt is that the movie was sooo low budget, the DIRECTOR of the movie drove the car for that stunt! A few years ago, Ol Burt fell onto hard times (allegedly) and began auctioning off his collection of memorabilia he’s kept over the course of his career. 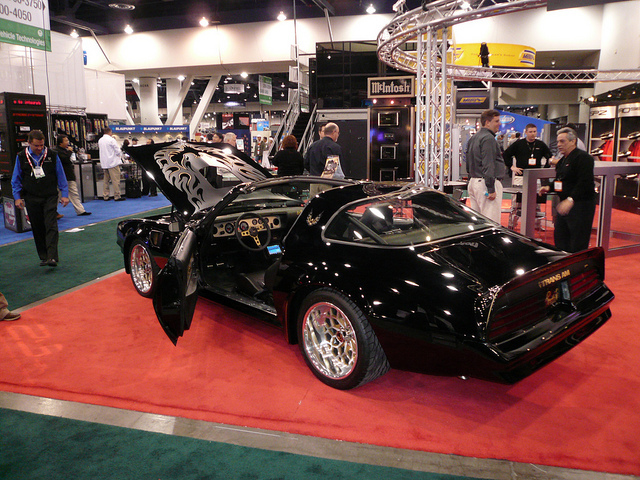 In that auction was his personal 1977 Trans Am that he’d used during the promo tours for Smokey and The Bandit. It sold for $170,000.